The previous instalment of this travel-report series concluded after leaving Oxford on Tuesday 22nd March 2016. This post brings the story of our ‘short holiday’ to its end with an account of the last day of the trip, Wednesday 23rd March. In the morning, after my brother had been dropped off, the three of us (my mother and grandmother, plus myself) headed over to Woburn Abbey. 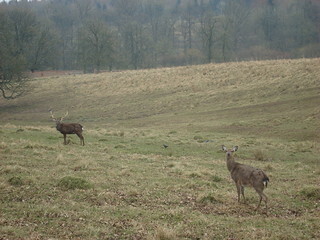 While their safari park is a segregated tourist attraction, a public road runs through part of Woburn’s deer park. 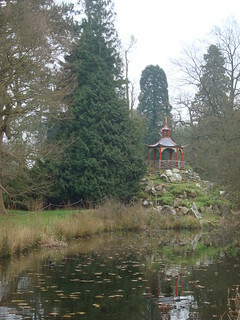 This had been an interesting feature of many of our journeys between our accommodation and the various places we had visited, and we drove through another part of it on route to the Woburn Abbey car park. Together we took a quick look around the Woburn gardens which, slightly unusually, featured a number of structures of oriental architecture (some of which I thought worked aesthetically). I then returned to the car and sat listening to music while my elders visited the house itself. My brother wasn’t doing a full day, so our next move was to go and collect him, before heading into the centre of Milton Keynes for the first time. We didn’t like what we found; the place was all very grey and dreary. Long, straight, dual carriageways flanked by car parking with a slightly shabby shopping centre. Post-Apocalyptic: Silbury Boulevard, Milton Keynes (photo by Tom Parnell). The overall impression of the place was ‘post-apocalyptic’. I’m not kidding, something about it reminded me of the scenes set in Pripyat in the game “Call Of Duty 4: Modern Warfare”; Pripyat being the city that was abandoned due to the Chernobyl nuclear power plant disaster. Being me, I blame the car. Milton Keynes appears to have been designed around it; the grid of roads (many being dual-carriageways), the acres of asphalt/concrete; all designed to support a population of motorists. At the time of writing, the Wikipedia article on Milton Keynes states that the central area was not designed as a traditional town centre. Instead, it is like out-of-town shopping centres (a “car-culture” idea, probably impractical to use on foot) but in the centre of town. Even ‘Milton Keynes Central’ railway station is on the edge of the central area, the wrong side of one of the dual carriageways, rather than dead-centre. Maybe there was a good reason for that; but I don’t know what that might be. 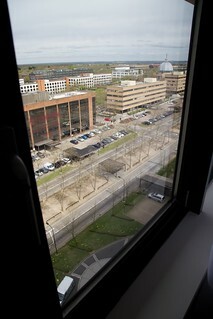 Just like motorways, Milton Keynes itself (what we saw of it, at any rate) is characterless, uninspiring and depressing. 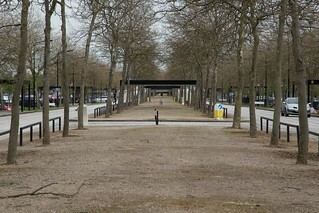 Although there is some greenery, even this is standardised and fails to prevent the place looking artificial and near-lifeless (again, just like motorways and most dual-carriageways). Almost needless to say, we didn’t stay long. But what was the best way home? I’m writing this some time after the event, so my memory is hazy, but I think I directed us along the A421 and A4421 to Bicester, then the A41 and M40 to avoid the Oxford ring road, then off the M40 at junction 8a onto the A40 briefly then the A329, B4015 and A415 to Abingdon where my plan unravelled. The traffic was terrible and it took us some time to get through the town. My mother, in the driver’s seat, was therefore rather displeased with my navigating (I think I may have had an alternative in mind, and may have even voiced it, but since that was using minor roads I doubt that would have gone down well either). Anyway, we eventually made it to the A34 and headed south towards the M4. On the way, I noticed that one of the minor roads alongside the A34 led to a place called “World’s End”, we drove right past it. This was the inspiration for the title of this post; very appropriate given that parts of our trip had been something of a culture-shock. I’m opposed to the proposed second M4 around Newport, and various other bypass projects, on the grounds that creating more space for more cars encourages even more car use, leading to increased pollution and congestion (leading to more tarmac and so on in a vicious circle). But having seen Milton Keynes, I wondered if it is already too late; have we already spiralled beyond the point where the car addiction is fatal to life on this good Earth? Returning to the journey, having joined the M4 at Newbury and travelled some distance along it, we had to turn off the motorway for fuel (at junction 18, I think), having just missed a service station. The road to Pennsylvania was “chock-a-block” with traffic so we headed in the opposite direction, hoping that the petrol station I could see on the map would be open; it was. It was on this little detour off the motorway that Mum cheered, having seen some cows in a field (she was suffering from ‘withdrawal symptoms’ caused by all the concrete and arable farming). Once back on the motorway, we made our familiar drive home along the motorway and A48 to Carmarthen and then on into the land of the living and home. What a relief; these few days were a real eye-opener for me. 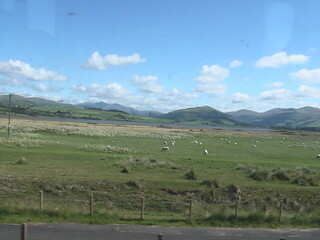 Beautiful West Wales: a view from the Cambrian Coast Line between Dovey Junction to Pwllheli. So, if you want to escape the post-apocalyptic concrete wasteland of southern England on your next holiday come to the west of Wales; but leave your car at home, we don’t want our country ruined in the same way. 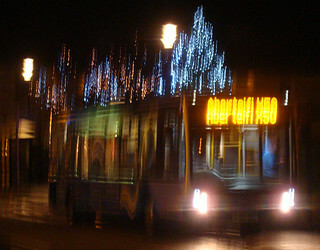 Use our ‘delightful’ bus services. Happy New Year (this post was scheduled to appear in the last minute of 2016, so by the time you read this it is probably 2017). Following the events chronicled in the first post on my model railway projects, I made a trip to our nearest Jewson store in search of a sheet of plywood and two lengths of 2-by-1 timber. Unfortunately they did not have birch ply, which my internet searches indicated was the recommended material for model railway baseboard surfaces. They did have sheets of ply the size I was after (2ft by 4ft) though so I purchased one along with the 2-by-1 timber which they cut into two lengths for me. Back at home, work continued on the baseboard legs. I cannot remember the exact sequence of events, but each of the tasks undertaken will be covered here (just not necessarily in the correct order). Somebody had found me some bolts to attach the legs, so four holes (one for each corner of the baseboard) were drilled to accept the bolts. As with the legs, the timer of the framework was rather hard; each hole took a while to drill and required a fair amount of pressure. The result of this was the drill would jump forward dramatically once it was finally through, hitting the internal bracing of the framework and causing me some alarm that the strength of the structure might be compromised. Fortunately the damage was minor and I was reassured that it was not a problem. After some measurements, I made a notch a short distance from each end of the two new lengths of 2-by-1 softwood timber. This was done by sawing roughly halfway through the timber and chiselling out the wood in between. The cutting was much easier than the old timber, and I doubt I would have been able to chisel it by hand as I did with the new stuff. These two lengths were then used to hold the base of the legs apart, with the notches slotting over the lower horizontal brace of the leg assemblies. At some point (probably before the notches were cut) it was noticed that these horizontals were not the same height above the ground, so one had to be moved to correct this so that the new spacers could work. Even now however, the table still wobbles slightly, though my idea of the new notched lengths of timber seems to help. I got out some track and had a play to make sure the layout I had in mind would fit. Interestingly, the arrangement I came up with was different from the plans I had created using layout planning software, so I recorded the plan (in the layout-planning program SCARM) before packing the track away. The ply sheet was varnished, both sides, and measurements were made in an attempt to get the ply centred on the framework (the framework is slightly smaller than the ply sheet). Eventually it was pinned onto the framework using about 12 pins around the edges. I may have got the ply slightly off centre, despite all the measuring, but I’m happy enough. Outside The Shed: the ‘completed’ baseboard (now only slightly wobbly). For this year anyway, and probably next year too. Today, (December 11th) the December 2016 to May 2017 rail timetable begins. This was also when the current Great Western electrification project was supposed to have reached Bristol, Oxford and Newbury. 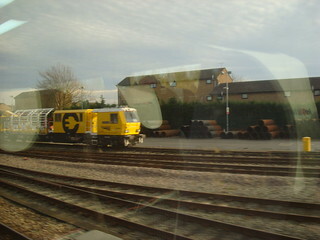 Now though, only one of these places, Newbury, is expected to receive wires by the time the current Network Rail control period ends (2019). 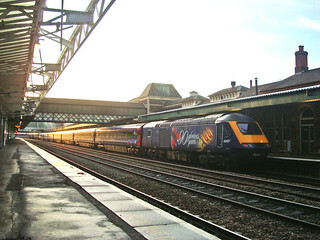 Alongside Newbury, electric trains from Paddington will be able to reach only one other Great Western intercity destination: Cardiff Central. 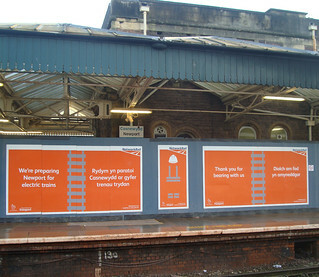 In fact the electrification to Cardiff, now due in 2018, is only one year late (it was originally supposed to be completed in 2017), whereas the rest of the project is much further behind schedule. I believe Network Rail’s latest update is that they expect the electrification infrastructure for Newbury, as well as Cardiff, to be complete and ready for passenger use in December 2018. Disturbingly however, timetabled public use of the electrification infrastructure is given as ‘CP6’ (2019-2024), rather vague. I hope that doesn’t mean the new class 800 trains will be running on diesel power to Cardiff/Newbury into the early 2020s. So, as far as Christmas 2018 is concerned, fingers are crossed (metaphorically). There are many reasons for the delays; but perhaps the most significant is a missed opportunity years ago. In 1981 British Rail published a report proposing an extensive electrification programme. In it, they stated that a commitment to a specific programme should reduce the cost of electrification as a result of “continuity of production”. That word ‘continuity’ is key. With unconstrained funding, the report stated, the best option would be to immediately embark upon the “the largest and fastest programme”. That would have completed electrification of many lines over 20 years, including the Great Western main line all the way to Penzance. Alas, the government never committed to it. Even the ‘do nothing option’ in the BR report included electrification between Preston and Blackpool, which apparently was expected to be underway in 1981. It was obviously cancelled, because we are still waiting for it in 2016; perhaps the people of Blackpool will have a Christmas present from Network Rail in 2017? Going back to BR’s ambitions, the government did eventually authorise some extension of electrification, most notably the East Coast Main Line (ECML) which was completed in 1991. Perhaps surprisingly, the ECML was electrified all the way to Edinburgh, despite the fact that electrification of the Midland Main Line to Leeds was not carried out (BR’s report had put that before ECML electrification north of Newcastle). Once the ECML was done though, it appears the government lost interest; the continuity was blown. Thus, when Network Rail was given the green light to electrify the Great Western, the UK rail industry’s last experience of a main line electrification project was almost two decades earlier. Unsurprisingly given the circumstances, there is a therefore a skills shortage, which cannot have been helped by the (otherwise extremely welcome) government commitments to electrification in other parts of the county. It isn’t just the Great Western of course, the various issues are also delaying the other electrification projects. Another problem has been scope creep; but the additional scope is not the “why not electrify this branch line while we’re here” kind, which would be a good thing in some respects. I’m talking about the requirements for the overhead equipment and, specifically, the distance between the live wires and various structures (and related ‘health & safety’ issues). British Rail had decided they could in some cases safely put the overhead wire closer to, say, a tunnel roof than Network Rail is currently doing, since the latter raised the required clearance recently. According to the November 2016 issue of Modern Railways this accounts for about half of the trouble on the Edinburgh-Glasgow electrification, as (for example) more bridges have to be raised (or the track beneath them lowered) to make room. Back on the Great Western, other issues are more serious; meaning the proportion of delay and cost overruns due to the increased clearance requirements is less than in Scotland. That Cardiff has leapfrogged Bristol in the electrification queue is perhaps an indication of one of the other issues; that the electrification is dependent on signalling works (and signalling resources are also scarce). The Cardiff Area Signalling Renewal (CASR) is due to be completed over the Christmas period this year, but some of the works at Bristol (and possibly Oxford too) aren’t due to happen yet. For example, I believe additional platforms are planned at both stations. So, perhaps part of the puzzle is simply that; rather than electrify Bristol and Oxford now and have to come back and wire up the new platforms when they are built, Network Rail will simply focus electrification efforts elsewhere until the station works are done before stringing up the wires. At least, that is what I hope will happen. The delays and, more significantly, the increased costs are raising concerns that the government may refuse to invest in further electrification. That would be a disaster; with electrification rail would remain one of the cleanest modes of transport, without it electric road vehicles might make a railway stuck with diesel look filthy. That said, given the resurrection of Heathrow’s ambitions for a third runway and the election of Donald Trump perhaps ‘disaster’ is too strong a word for the possible death of rail electrification. 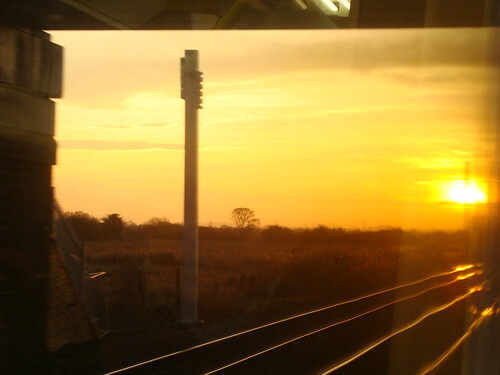 Sunset On Electrification? 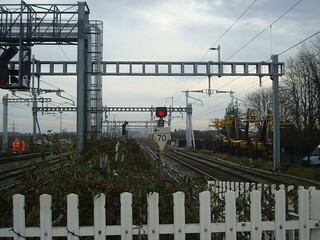 Electrification masts in place near a bridge between the Severn Tunnel and Cardiff. Will the electrification programme survive the troubles it has encounted? Let us hope that it will.